The inexorable march to completion of the Shaintar Kickstarter is now a sprint as books come flying out of Savage Mojo, and here’s the latest. 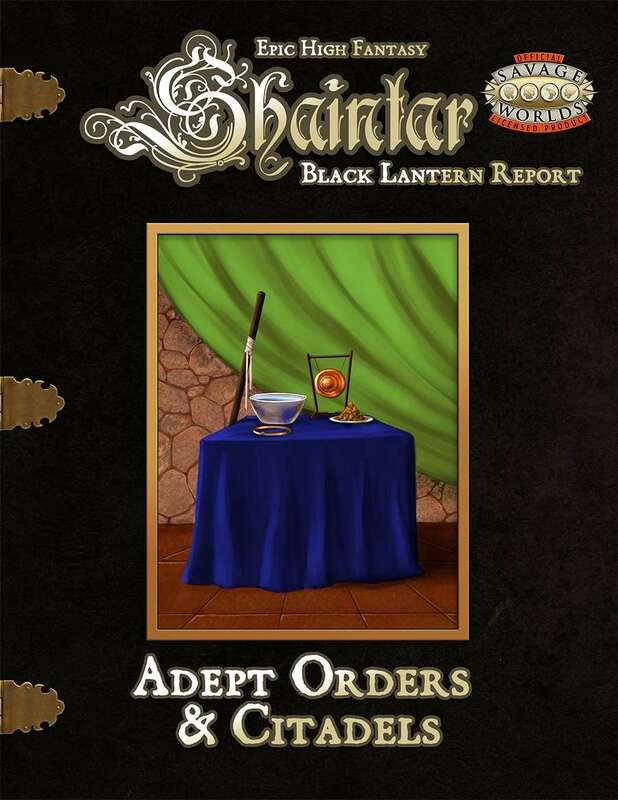 Anyone interested in fantasy psionics, especially for Savage Worlds, should grab the Black Lantern Report: Adept Orders & Citadels. The Adepts are a mysterious group. Originally following the Way as taught by the Dregordians, these people have an extreme control over their own minds and bodies. Some few, such as some members the Warrior-Adepts of the Jade flame can attack others mind to mind, or influence them subtly. Other orders focus on the balance between mind and body. The Farspeakers guild also draws its numbers from the Adepts’ numbers. In this book, you’ll learn about the various orders, find out where most of the Citadels are located and finally be told about the black Orders that work as mercenaries for anyone no matter the task – even if it means working with slavers and the like. You’ll also find new gear, power edges, edges, Adept disciplines and read some rumors that might need to be investigated. Sometimes, a gamer creates a bunch of great stuff for his own purposes. His friends see it and say “You should totally share that!” Those of you who love dungeons are very fortunate that Matt Davids of Dicegeeks is one of those folks. Behold – 177 Dungeons for the Master. Your players now want to explore the ruins you mentioned in an offhand remark. Don’t worry. 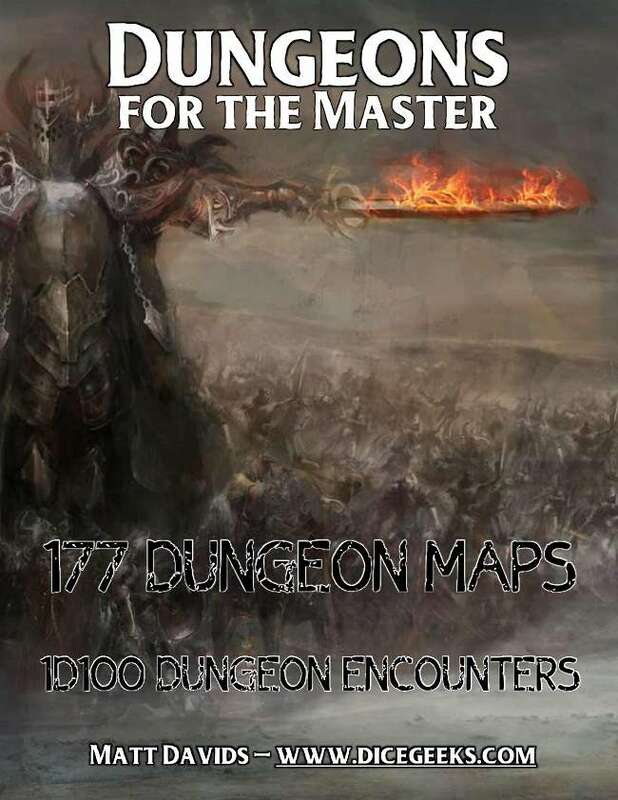 With this ebook of maps, you’ll have an exciting dungeon ready to go before your players can open the Doritos bag or check Facebook. Game masters never get caught without a dungeon map ever again. Never worry about your players straying from the main adventure. Always have a dungeon ready to go. 100 hand-drawn original dungeon maps. These maps will only be available in this PDF. Unique dungeon names to get your creativity flowing. A comprehensive 1D100 table of dungeon encounters. Have characters fall into fiery pits, not cliches. Plus, all the maps I have ever posted on my blog or included in free products. The total number of dungeon maps is 177! Before I get into the specifics of today’s Pick, a couple of important notes. First off, apologies for the page being down over the last couple of days for many of you; there was some of that Magic Internet Stuff happening in the background that occurs when a site host makes huge internal changes and those of us ignoramuses on the user end have no idea what to do. That’s clearly been resolved, but it took a bit. Thanks for your patience. The other thing, which is much bigger, is the change I am launching next week. Starting on Monday (Halloween), I am inverting how I do things with the Pick of the Day and the Picks of the Week. The Pick of the Day will now appear first on E.N. World, specifically on the ENN News Network. I will then share it here on the Pick of the Day web site, and I will also collect the week’s Picks and share them as a unified roundup article on Fridays. This will make things a lot better for me overall, friends, so I hope you can support this decision and enjoy the content as always. Now then, speaking of content, there’s a huge amount of it on sale over at DriveThruRPG and all of the sister sites. As well, the annual Trick-or-Treat Jack-O-Lantern search is going on right now, where you can get some great additional deals, free stuff, and some funny “tricks” as you search all the sites and find them. 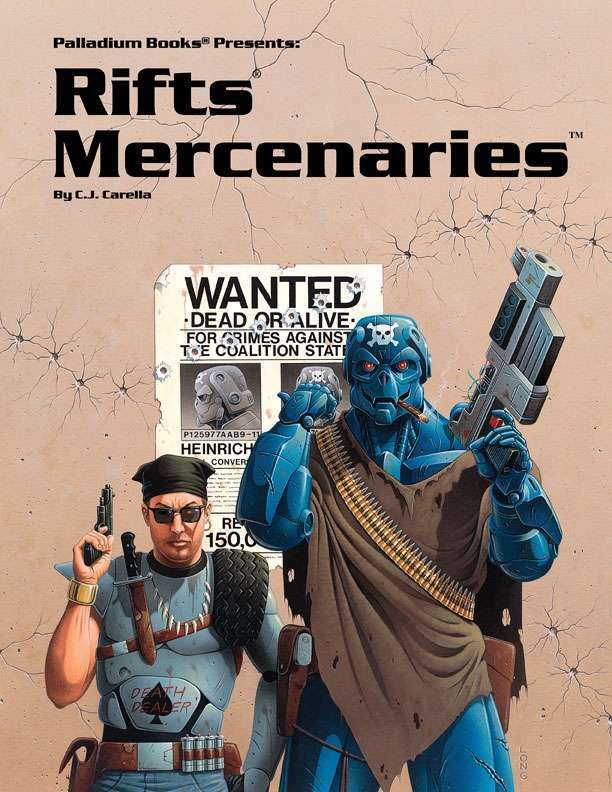 Whether you are a long term fan of Palladium’s Rifts, a returnee or newcomer thanks to Savage Rifts; or simply interested in some great information on running campaigns that feature post-apoc mercenaries; this rather famous book from the original Rifts line has a lot of great stuff for you. A giant sourcebook for the Rifts® Role-Playing Game. 9 new Occupational Character Classes including the Bounty Hunter, Master Assassin, Smuggler, spies and more. Rules for creating a mercenary company. Six NPC mercenary companies are described, complete with key characters, villains, history and adventure ideas. Some are good, some evil, others more than they seem. Transdimensional mercs and arms dealers. More weapons and equipment from Northern Gun. Scores of new weapons, bots and vehicles. Additional hints and data about the Coalition States, Tolkeen, the Pecos Empire and visitors from other dimensions. Tons of adventure ideas, characters and more! This morning, I’d like to bring your attention to blog entries of note. The first one is written by my friend and colleague, Steve Kenson, who understands the issue discussed in his latest blog post better than most of us. He gets into the difference between establishing equality in your game or setting and actually promoting inclusivity. An important and worthy read. As well (and far less important, but hopefully fun and interesting, nonetheless), I’ve launched a new regular article over at the Stuffer Shack. It’s called Life of a Big Irish Gamer, and it’s pretty much what the title sells it to be. If you’d like to know more about the stuff I watch, do, and experience as a part of being a professional game writer, publisher, and GM, check it out and let me know what you think. Something about facing the darkness of the world and kicking it square in the nethers seems to be of high appeal these days, and here’s another powerful example of the trend. It’s post-apocalypse in one of the strangest ways, though in the same neighborhood as The Day After Ragnarok. The Kickstarter got some solid attention, and it’s clearly climbing the charts. A tabletop RPG about callous survivors scavenging the abyssal guts of the world-eating Beast that consumed their home. You are a scavenger. Driven by the primal instinct to survive, you venture into the depths of the Evergut in search of some remnant of the past that will postpone your inevitable digestion. The land was resplendent once; sprawling forests, massive ranges, glittering coastlines. Hundreds of clans, nations, and empires carved their homes from mountain and glen – living and killing and loving beneath the sun-kissed boughs. But that was a lifetime ago. For generations the survivors have known nothing but sorrow. The Hungry God consumed all, leaving the world as little more than a skinned carcass moaning to be put out of its misery. Millions were swallowed during the Great Devourer’s gluttonous feast; and yet, humanity pressed on. 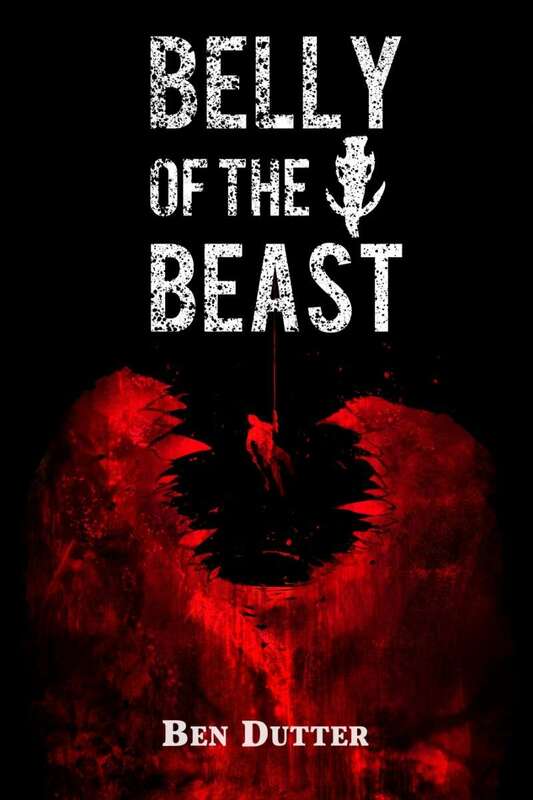 Belly of the Beast is a tabletop roleplaying game focusing on scavengers: brazen survivors that plumb the depths of a world-eating monster’s guts, scouring the remains of the mighty Empires that were eaten by the Beast. The core mechanic uses the well-tested Ethos Engine (Vow of Honor, Hunt the Wicked). It is a d6 dice pool in which you gain and spend dice toward your Instincts (Greed, Violence, etc), and roll against the most relevant Skill’s rank. The more successes you roll out of your d6 pool, the better your outcome. The game is certainly task-resolution oriented, and focuses on grim and gritty people and their personal stories, rather than epic or high fantasy. Take the trappings of a late-medieval Byzantine Empire and throw it through a blender. The Beast is a monster the size of a mountain range, and it has happily gobbled up all of the world’s surface — including its cities, people, and artifacts. You’re one of the survivors, either recently swallowed in the Beast’s inexorable buffet, or you were born there in the last 60 years, eeking out a living within the cavernous innards of the Evergut. I once referred to Godbound as “Scion-meets-Rapture: the Second Coming.“ It’s an Old D&D gaming experience oriented around an after-the-end, new beginning world where new gods arise, so it’s way beyond the 10′ poles territory. This is a powerful adventure to get your group started in this very interesting world, where they must learn to master their power before the world masters them. In the market town of Gongfang a restless magistrate oppresses the people, forcing them to surrender sons and daughters to serve a mysterious sorcerer on Red Crow Mountain. In the countryside, a wealthy rice broker torments the common folk with his extortionate exactions, driving the desperate into the forest to escape his thugs and bandits. And beneath those green boughs there are whispers of an illicit god, of a Golden Lord who will bring justice to the afflicted. Gongfang’s fragile peace cannot last. But who will strike the blow that ends it, and who will pick up the fragments that remain? Ten Buried Blades is an introductory adventure for the Godbound role-playing game of heroic demigods, available in both a Free Version and a Deluxe Edition. The misfortune-plagued border town of Gongfang is presented for the heroes’ attention, with a fistful of calamities and sinister figures for the PCs to encounter. 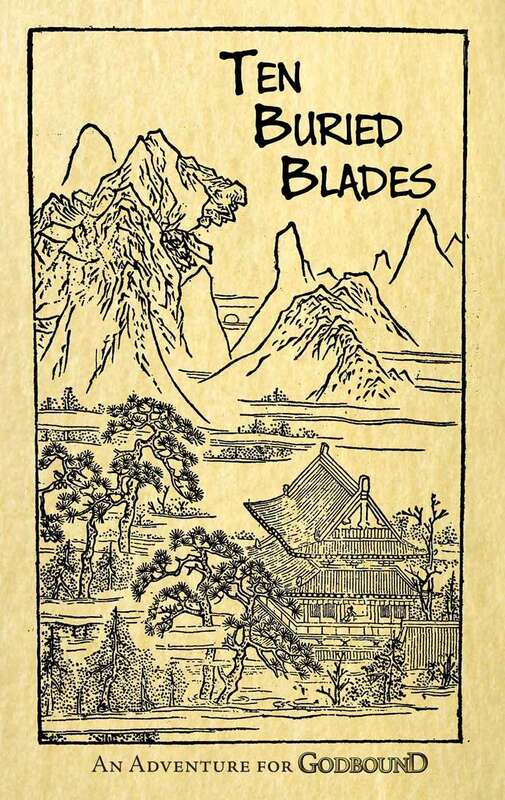 As an introductory adventure, Ten Buried Blades is written to help the novice Godbound GM and is structured to answer many of the questions that come up when you’re hurling a pantheon of young divinities against an uncaring world. Within these pages, you’ll find…. Challenges and encounters built to match a pantheon of newly-created Godbound. Some can be overcome by divine force, while others compel the PCs to deal with situations that don’t yield so easily to a bolt of celestial fury. Do you want were-beasts? Because this is how you get were-beasts! Specifically, how you get were-creatures and lycanthropes for your Pathfinder campaign, from the House That Knows Pathfinder, Rogue Genius. Everyone knows about lycanthropes, right? They get grumpy in moonlight, dislike silver, and should avoid hickies. What more is there? Actually there’s a whole world of werebeasts and werecultures, just waiting for you to discover! 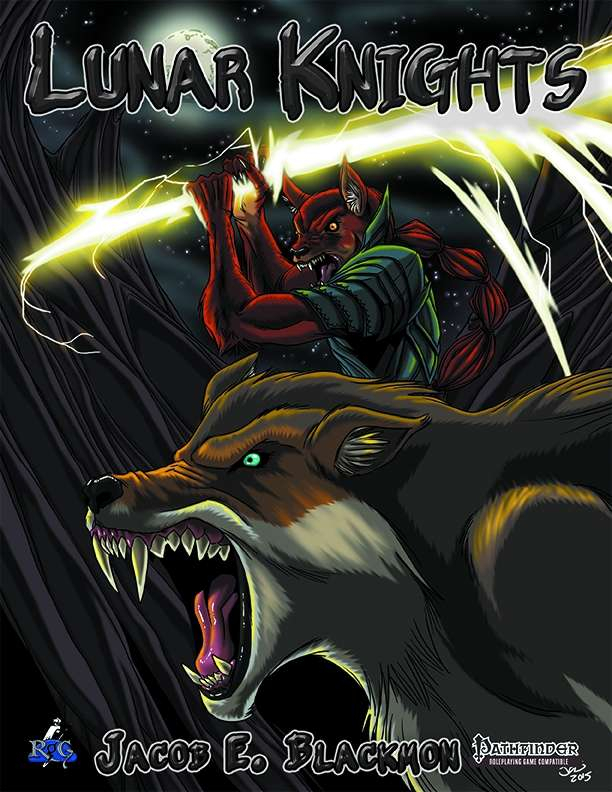 Lunar Knights presents a world of shapeshifting options, from campaign options on how to handle lycanthropic curses, variant lycanthropes based on various mythologies, new shapeshifting-themed class features (ranging from the barbarian’s lycanthropic stalker to a sorcerous lycanthropic bloodline), new feats, new forms of lycanthropy, and even lycanthropy-specific prestige classes—including the dire lord, moon priest, and even the lunar knight! So pack some extra wolvesbane, polish your silver sickle, and get ready for a big dose of the hair of the dog that bit you! The last of the Shaintar books for the Kickstarter are flowing out of Savage Mojo, and this one covers the various guilds, schools, and other organizations that practitioners of the sorcerous arts gather under for knowledge, understanding… and other purposes. 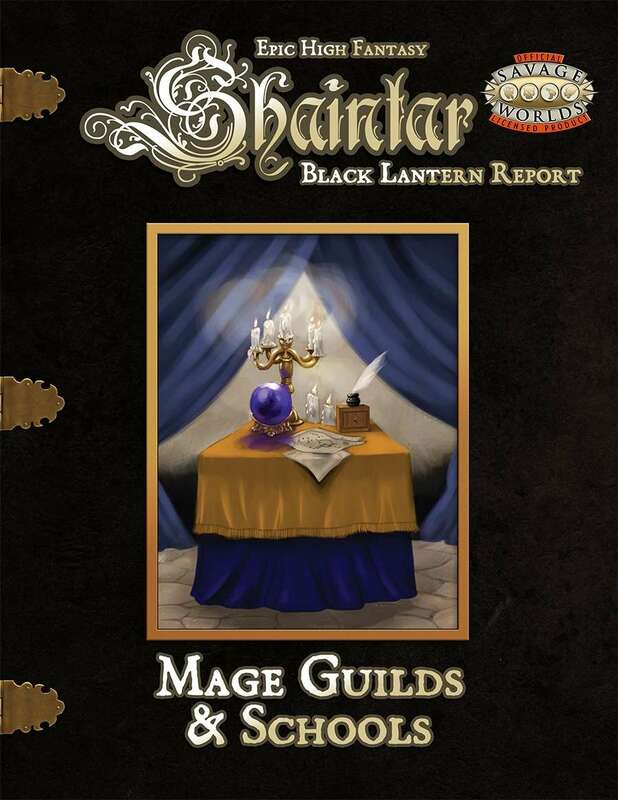 This is the Black Lantern Report: Mage Guilds & Schools. Meet the irrepressible Brenna McIntyre, senior student of the School of Seven Stars and Brother Spark of the Black Lanterns. Given that our Brother is in a place of magic, he chose to err on the side of caution and not file his reports in the normal way. Instead, she sends letters home to her “parents” and other family with no one the wiser that the family she writes too is us. Her reports seem innocuous but she’s provided us a great deal of information on the names and locations of these schools along with the types of magic you’ll likely find being practised. She’s also provided us with the names and abilities of several of her teachers along with a number of new spells, applications and items that an up and coming sorcerer can use to remember certain types of spells better or enhance one of their senses or abilities. You’ll find what you need to develop a history for a character or NPC that includes these schools, what a person would study there and how their days are structured. You’ll also find some new magic items, gear, edges, powers, spells and applications too. Been a lot of talk online about this Traveller variant, featuring a new sci-fi setting gaining in popularity called the Clement Sector. Now they’ve released a core book that stands as its own game, blending core Traveller design with their own Cepheus Engine (effectively, a refined retroclone of the classic rules). As the buzz increases, now’s a good time to check it out in this era of renewed interest in sci-fi RPGs. Join the adventure as Clement Sector, one of the most popular and fastest growing science fiction settings, expands with its own rulebook! 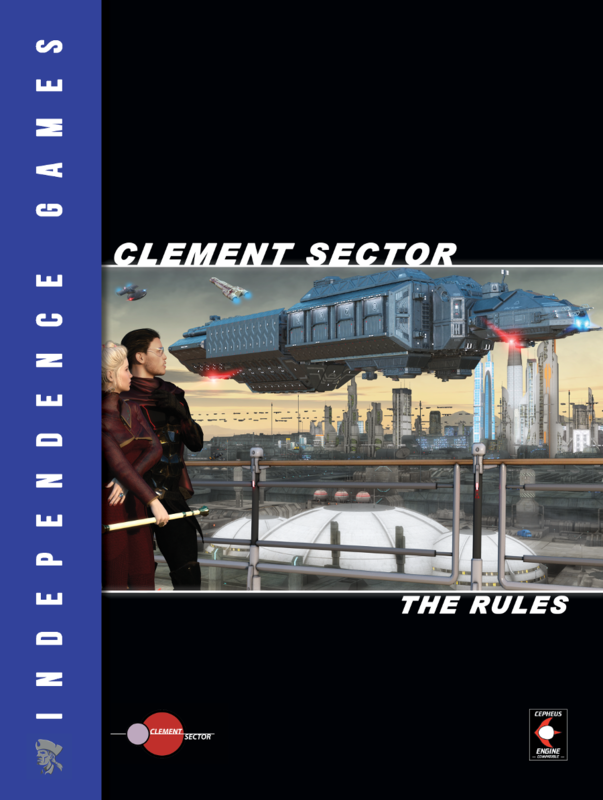 Using a unique blend of The Cepheus Engine and the 2d6 Science Fiction OGL rules, Clement Sector: The Rules builds on those to create a framework for action packed role-playing game excitement! Fight epic space battles! Explore new worlds! Become a pirate! It’s all possible in Clement Sector and these rules provide the foundation for your exploits! Use these rules for your own settings or, in concert with The Clement Sector Core Setting Book, strike out on an adventure in the Clement Sector setting. It’s in your control! Be sure to look out for the Clement Sector Core Bundle which gives you these rules, The Clement Sector Core Setting Book, and The Anderson and Felix Guide to Naval Architecture at a 20% discount to the everyday price. Join the adventure! Don’t get left behind!